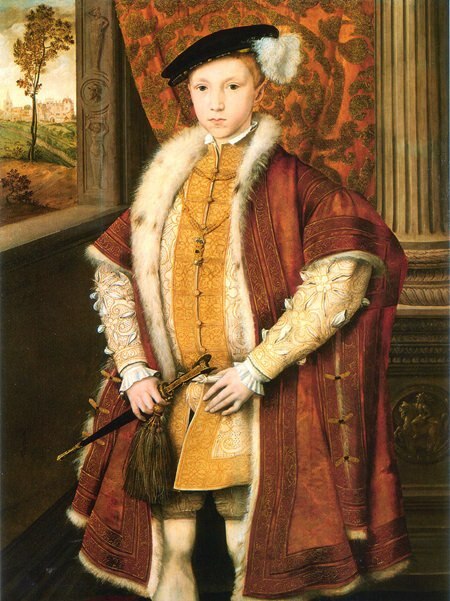 Prince Edward in 1546 aged nine – the year he was crowned King of England. In an attempt to improve my slender knowledge of science, I’ve just waded through Stephen Hawking’s book The Grand Design, an introduction to the esoteric world of quantum mechanics. Perhaps I should add that quantum mechanics are not, as some might imagine, people who repair quantums. It’s a branch of physics which explores the behaviour of the tiniest particles in existence and it’s fascinating. Although Hawking and his co-writer Leonard Mlodinow do a decent job explaining an incredibly difficult subject, I found some parts of the book a bit heavy going, especially when it comes to the supposed curvature of time. So to provide some light relief from the quarks, hadrons and leptons, I turned to Mark Twain’s delightful novel The Prince and the Pauper, published in the early 1880s and subtitled A Tale for Young People of All Ages. This enthralling story mixes real people with fictional characters and it’s set in the first couple of months of the year 1547. The central character in the book is the real-life Edward Tudor, Prince of Wales and later King Edward VI. You may recall the plot in which, as a prank, the nine-year-old prince swaps roles with an identical looking boy from a poor family in East London. Mark Twain gives a fascinating glimpse of the social customs and moral values in sixteenth-century London. But he drives the plot along with tremendous pace and makes the book irresistible. I got through it one afternoon and evening. On 20 February1547, Edward was crowned King of England at the age of nine. He was the son of King Henry VIII who had died the previous month. Henry was a talented composer and played various instruments of which he had a large collection, including seventy-eight recorders. He would certainly have encouraged his son, who was an extremely intelligent boy to become involved in music. We know that Edward learned to play the lute and the virginals, a keyboard instrument a bit like a small harpsichord. Reading Twain’s novel, I began to wonder what music Edward would have heard, for it was central to the life of the royal court. Christopher Tye knew Edward personally both as prince and king. He worked closely with him and appears to have been a personal friend. Tye was one of the most influential English composers of his day and he acted as a kind of musical adviser to the royal court. During the sixteenth century, the expression In Nomine (in NOM-in-ay) was a general-purpose title used extensively for short instrumental pieces. They were usually written for a consort of four or five instruments, typically viols or recorders. Tye wrote twenty-four In Nomines and Edward would undoubtedly have been familiar with some of them. He might have even have played them too if he had, as likely as not, inherited his father’s skills on the recorder. We tend to associate the recorder with that ghostly hooting sound made by elementary school children, but during the early sixteenth century the recorder was one of the most important wind instruments. The instrument was made in several different sizes and a recorder consort usually contained a variety of instruments ranging from the high-pitched sopranino to the somewhat unwieldy bass recorder. Tallis is ranked among England’s greatest composers and his name has become synonymous with choral music. Edward would have been familiar with the music of Tallis and would certainly have met him, for the composer became a Gentleman of the Chapel Royal in 1543 at which he composed and performed for both Henry VIII and Edward. In the sixteenth century following prevailing fashions in Europe, it became customary for composers to set various texts from the Book of Jeremiah. Tallis set the first lesson sometime between 1560 and 1569. This rich, powerful and beautifully-crafted music is typical of Tallis and much the sort of musical style Edward would have heard in the Royal Chapel. Sadly, the young king didn’t live long enough to relish this particular work. With a promising life ahead of him, he tragically died on 6th July 1553 at the age of sixteen, thus missing out on the great flowering of English renaissance music that was yet to come. However, to end on a slightly merrier note, if you have one of those amazingly useful Kindle devices for reading books, you can go to Amazon online and order an instantaneous download of Mark Twain’s The Prince and the Pauper for less than a dollar. So if you haven’t already done so, there’s no excuse for not reading it. Next articleA Salad? How about Spicy Tuna?